1. Clove's Villa: This is where Dia lives and where Gina and Martha works. It is a closed off Villa separated from the rest of the island. 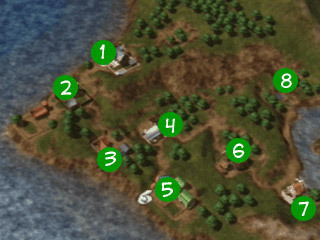 Behind the Villa is Praria Forest where you will have to venture off to in one of the Endings. 2. Brownie Farm: This is where the whole Brownie Farm is located. You will come here to find part time work and to pick your horse. There is a Barn with animals, farm where the grass is and horses graze, and the shop where you can go to find some Part-Time work. 3. The Shops: At this location you will find Lyla's Flower Shop and Louis's Tool Shop. Come here to purchase any of your farming goods and crops that you may use throughout the game. 4. Supermarket: Here you will find Ronald's Supermarket and Ronald's Chicken Coop. You can come here to buy many edible goods and even to sell some. You will also find Ronald's Chicken Coop which is where all of Ronald's Chickens are at. 5. The Farm: Of course the Hero needs a place to stay, why not his own farm? This is where the Hero (you) lives and works. All farming is done here with a some interation as well. 6. Walnut Forest: This is where the Carpenter lives and works. You often will see his apprentices choping up wood here. Come here if you would like to upgrade your farm. 7. Maple Lake: This is where you will find the Sunny Garden Cafe & Bar right along Maple Lake. You can fish at Maple Lake, or stop at the Cafe/Bar throughout the day to revive some of that used up stamina. 8. Harvest Goddess Lake: You will find that this location is a magical place. You will often see the Harvest Sprites here, along with that is a small pond. In this pond lives the Harvest Goddess who plays a key role in saving the homeland. Use items grown on your farm to throw into the Pond to awaken the Harvest Goddess.